While it is natural for discussion of waterfalls in the Mount Shasta area to cast its first gaze on the cataracts on the great mountain itself, any further conversation must immediately turn to the three waterfalls on the McCloud River. 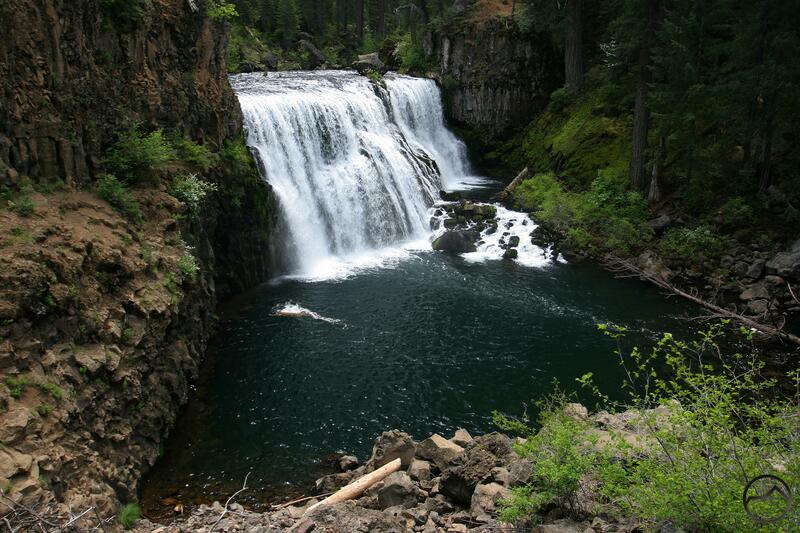 Middle McCloud Falls is one of California’s top tier falls. Combined with Middle Falls’ upper and lower siblings, the falls of the McCloud River offer an exceptional waterfall experience. The great virtue of these waterfalls, the attribute that sets them apart from many of the other waterfalls in California, is the fact that it is not just a creek pouring over a rocky lip but the full fury of a large river hurtling itself over the edge. Outside of Yosemite, there are few waterfalls in the state that can make this claim. Further adding to the beauty of these waterfalls is the remarkably different character each exhibits. Tying all them together with a hike on the McCloud River Falls Trail affords hikers the chance to enjoy each of the three diverse cataracts from a relaxing and extremely scenic trail. Though this hike is not difficult, it is one of the scenic highlights of a visit to the Mount Shasta area. 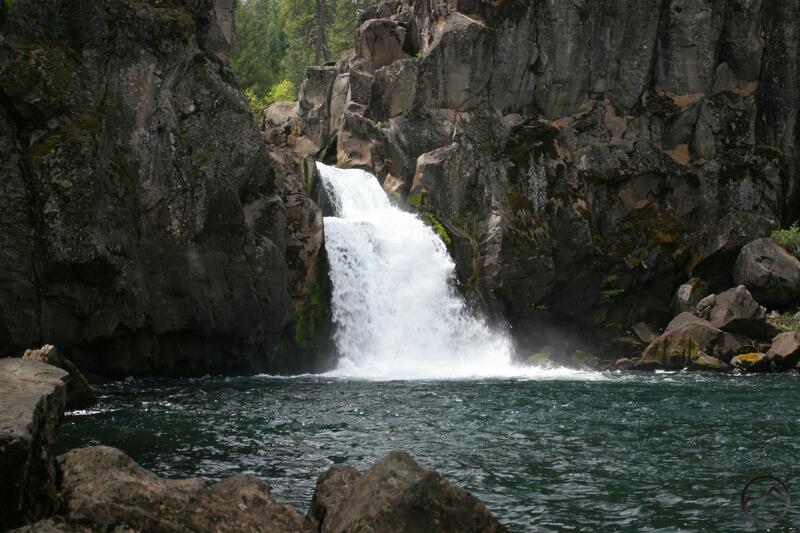 Most people who hike the McCloud River Falls Trail begin the trip at the picnic area just below Lower Falls. There is a great vista of the falls from the picnic area. The smallest and most subtle of the three falls, Lower Falls is perhaps the most enjoyed of the trio of McCloud Cataracts. Above the falls the McCloud River flows for a short distance through exposed volcanic bedrock. It appears as though a giant bite was taken out of the bedrock, causing the river to thunder down into the resulting cavity. The hardened bedrock that lines the rim above the falls offers warm places to stretch out and soak up the sun after folks have taken a leap into the deep, roiling pool at the base of the falls. The proximity to the picnic area means that these features are easily accessed and often enjoyed. For those fortunate enough to view the falls during the rush of high water during the spring thaw, Lower Falls changes its demeanor, widening its channel considerably and pouring over a significant amount of the bedrock rim above the pool. Tall, wide and ferocious, the thundering curtain that is Middle Falls is one of California’s first rate waterfalls. About 100 feet across and 50 feet high, the McCloud River spills like a surging white tapestry over a lip of hard basalt. Easily the largest waterfall in the Mount Shasta area, Middle Falls is also one of the most subtly dramatic. With a waterfall this powerful, it is easy to overlook the smaller things that are the fall’s highlights. As the river goes over the edge it breaks up into numerous individual streams pouring into the large pool at its base. There is a seemingly random alternation between streams that free fall into the pool and streams that crash into hard rock in mid-fall and explode into white spray before making a final plunge. This imparts the sense that Middle McCloud Falls is in fact a competition between numerous small cataracts, each vying for a hiker’s attention. The falls are also broken up in the middle by a large rock rib that runs along the fall’s entire height. The half of the falls that are on the south side of the rib is a little shorter, falling into a small, subsidiary pool and then cascading down a large pile of rock into the river’s main pool. It is an exquisite and intricate arrangement. All of this added together, along with the large volume of the McCloud River, make the Middle Falls one of the top waterfalls in the Mount Shasta area and beyond. 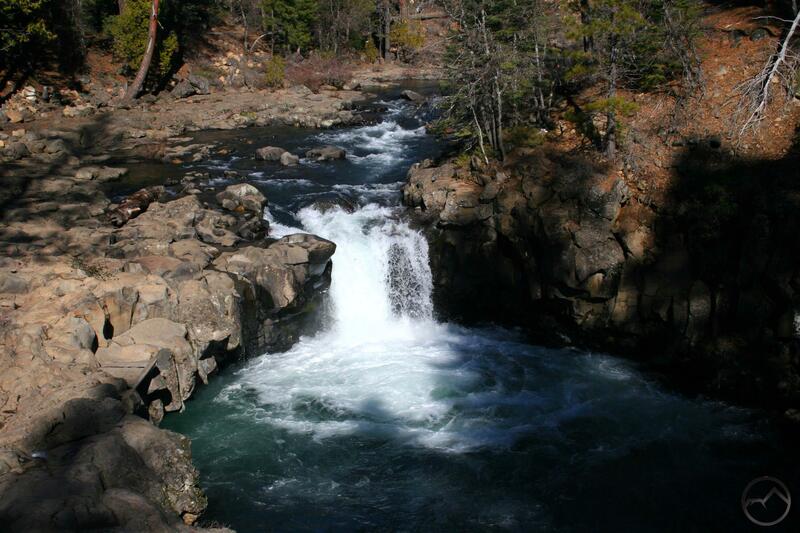 A strong case can be made that Upper McCloud Falls is the most unusual of the three falls on the McCloud River. Though not as tall as the Middle Falls, it is considerably higher than the Lower Falls. Like its Lower sibling, Upper Falls is formed where hard volcanic bedrock has had a large bite taken out of it, leaving a deep pool in the resulting cavity. However, unlike Lower Falls, Upper Falls has worn a deep trough through the bedrock precipice. Consequently, the McCloud River shoots through an increasingly deep and narrow chasm before leaping over the cliff. About a third of the way down the river hammers into a large stone bulge and then leaps outward again in a broad sheet before crashing into pool at its base. Although the falls are certainly impressive, it is perhaps more interesting to gaze down at the river as it rockets through the narrow channel just before going over the edge. It is an exciting spectacle to behold. There are a few other notable waterfalls in the greater McCloud area. Not too far downstream from Lower McCloud Falls are the amazing Big Springs of the McCloud. Here large springs erupt along 0.25 miles of the river, falling 15 to 20 feet into the McCloud. It is a staggering site seeing so much water emerging from the cliffs along the river. Unfortunately this phenomenal waterfall is on private property and only visible while kayaking down the McCloud River. 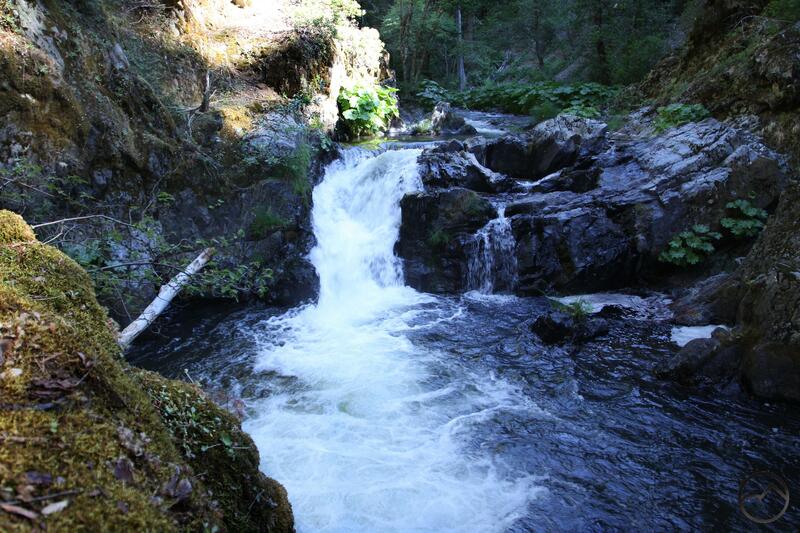 The other most notable cataract in the McCloud area is Squaw Valley Creek Falls. Though it is certainly less exciting than the trio of waterfalls on the McCloud River, the small waterfall on Squaw Valley Creek is still an extremely pretty little cataract. The hike to these falls on the Squaw Valley Creek Trail is well worth the effort, both for the waterfall but also for the wild and beautiful creek itself. You ever jump in those pools? Just the lower one. Some people do the Middle Falls, but that one pushes my limit. I have seen people kayak through the upper falls but never just jump off the cliff. These falls are stunning! I love the one looking down on the middle falls because it shows the river flowing along, relatively harmlessly, then –crash! off the cliff. It’s wonderful. Your absolutely right. 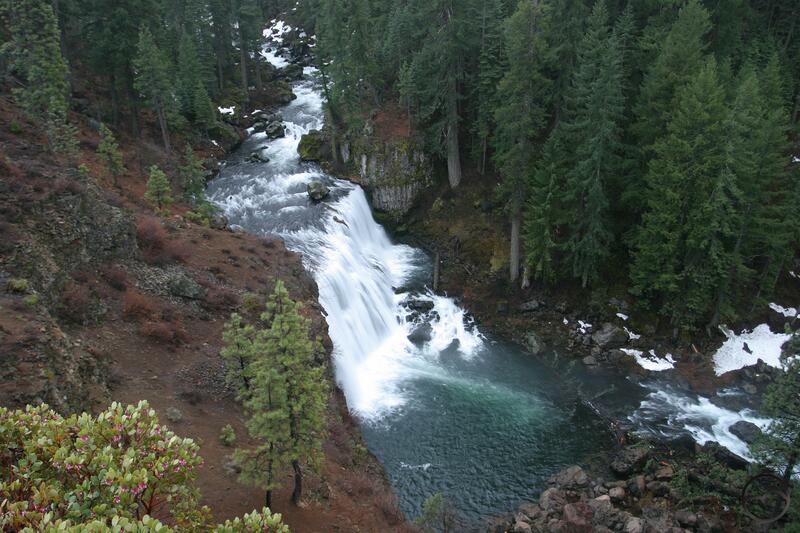 The McCloud River is very swift moving but there are no real cataracts or waterfalls on it except the big three. It just races along and then bam! The volume of water also makes them, especially the middle falls, very dramatic. You captured that beautifully with your photo.